We have endured a colder than normal winter in much of the United States. Beekeeping friends in Minnesota, Michigan, and Maine reported to me that their hives were in deep snow during much of the winter. Arkansas saw little snow, but received several significant ice storms. Speaking at a business luncheon today, I was questioned by many in the audience about how the honey bees fared over our colder than normal winter. I explained to the business leaders, who are truly concerned about the condition of bees, that it appears that our Arkansas Delta bees survived quite well. The cold weather kept the bees clustered in the hives, expending only enough energy to warm the cluster. Warmer winter weather often allows the bees more flying opportunities. Foragers searching in the winter for blooming flowers expend energy and consume greater amounts of stored honey. Fortunately, I set up my hives for the winter with plenty of honey stores. Still, they consumed large amounts of dry sugar that I placed atop the hives’ inner covers as a precaution against starvation. March is the harshest month of the year for honey bees. 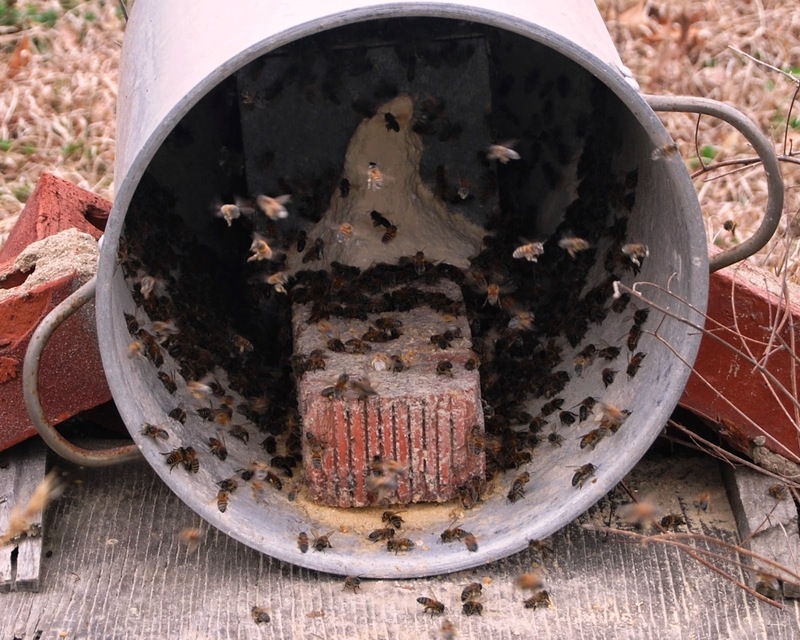 After surviving a cold winter honey bee colonies often starve during the month of March. At this time of the year, colony populations are growing rapidly with nurse bees feeding large amounts of brood. Warming days allow bees to fly and forage, however, flowering plants are not yet blooming in abundance. When checking on the bees in March, even on cool, blustery days when it is not safe to open the hives, it is a good idea to gently lift the rear of the hives and estimate their weight. Light hives may be depleted of honey stores. Since honey bees share their food, starvation of the colony occurs at once. Some emergency feeding may save a strong colony from starvation. Today’s photo shows bees eagerly dusting in pollen substitute offered to the bees in a bucket for protection from the weather.